Livedoid vasculopathy (LV) is a non inflammatory thrombotic condition, characterized by recurrent painful purpuric ulcerative lesions around ankle and dorsum of feet that heal with stellate porcelain white scars. It can be associated with thrombophilias, fibrinolytic disorders, autoimmune diseases and malignancy. Histopathology reveals segmental vessel wall hyalinization of dermal blood vessels with fibrinoid deposition in lumen and minimal perivascular lymphocytic infiltration. Neurological involvement in LV is rarely described and presents usually as mononeuritis multiplex, months to years after onset of cutaneous lesions. Polyarteritis nodosa (PAN) is a close differential diagnosis. Workup requires a deep skin biopsy to primarily exclude PAN. Rheumatologists should be aware of this entity that can sometimes be managed with anticoagulation alone. A 34-year-old female, with no comorbidities, presented with recurrent ulcers over the bilateral lower limbs around the ankle and dorsum of the foot for 1 year. Ulcers were painful and healed spontaneously over a few months leaving behind whitish scars, only to recur again over a fresh site. She also had complaints of numbness and burning sensation over her medial two fingers of left hand and medial aspect of the left forearm that started 1 month ago, followed a few days later by difficulty in making a fist. There was no history of fever, weight loss, myalgias, joint pain, Raynaud's phenomenon, or oral ulcers. No history of any other organ system involvement. She had no history of spontaneous recurrent abortions or deep vein thrombosis. On examination, the patient had livedo racemosa over her left upper limb. Multiple stellate purpuric ulcers with crusting were present behind the right lateral malleolus with surrounding multiple healed porcelain white scars. Similar lesions were present around the left lateral malleolus and dorsum of the left feet. A 3 cm × 1 cm ulcer with crusting was seen around the left medial malleolus [Figure 1]. All peripheral pulses were palpable. Blood pressure was 110/80 mm Hg. Neurological examination revealed decreased touch, pain, and pinprick sensation over the left distal medial forearm, ulnar border of hand, and medial one and half digits. The motor weakness of intrinsic muscles of left hand supplied by ulnar nerve was present. Possibilities considered were livedoid vasculopathy (LV), medium vessel vasculitis – polyarteritis nodosa (PAN), and antiphospholipid antibody syndrome. Investigations revealed hemoglobin of 13.7 g%, white blood cell count of 12,500/mm3, and a platelet count of 3.31 lac/mm3. Erythrocyte sedimentation rate of 25 mm/h and C-reactive protein was 11.11 mg/L. Renal and liver function tests, blood sugars, and urine routine were within normal limits. Viral serologies (HIV, hepatitis B surface antigen, and hepatitis C virus) were negative. Venous Doppler bilateral lower limbs were normal. Thrombophilia workup was done before starting anticoagulation therapy. Prothrombin time/international normalized ratio was 0.86, and activated partial thromboplastin time was 38.4 s. Anticardiolipin (IgG and IgM), antiB2GP1 (IgG and IgM), and lupus anticoagulant were negative. Antinuclear antibody and antineutrophilic cytoplasmic antibody by immunofluorescence were negative. Serum homocysteine levels were normal. Protein S functional activity was 28.4% (normal 50%–140%), and free antigen levels were 38% (normal 60.1%–113.6%) were reduced, while protein C and antithrombin III functional activity were normal. Factor V Leiden mutation was negative. Serum cryoglobulins, cryofibrinogens, serum protein, and immunofixation electrophoresis were not done. Nerve conduction studies revealed decreased amplitude over the bilateral common peroneal nerve and left ulnar nerve, increased latency, and decreased the velocity of left ulnar nerve with absent sensory nerve action potential over the left sural nerve. 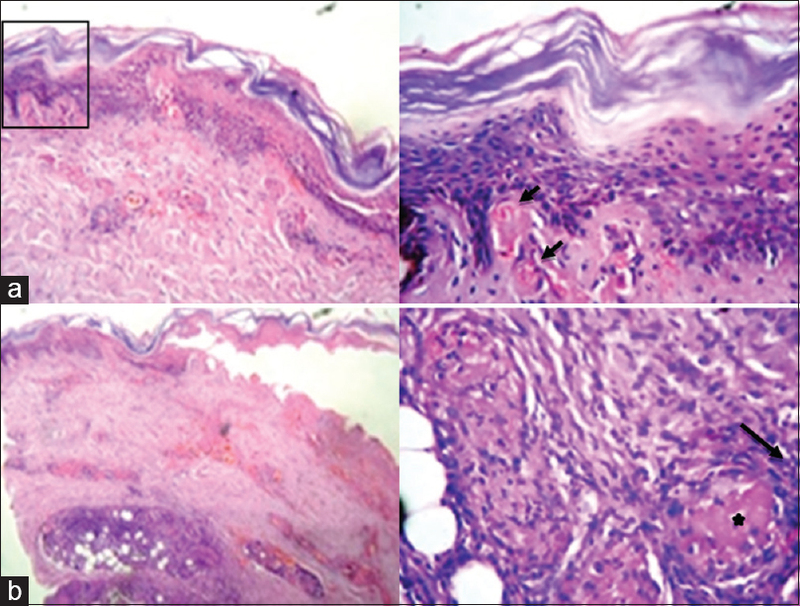 Skin biopsy from ulcer edge revealed fibrin deposition around the dermal vessels occluding the lumen with sparse chronic inflammatory infiltrate consistent with LV [Figure 2]a and [Figure 2]b. Sural nerve biopsy was planned; however, the patient refused. Computed tomography angiography of the abdomen to rule out the presence of an aneurysm was not done in the absence of abdominal symptoms. Primary diagnosis made was LV with ischemic neuropathy due to underlying procoagulant (i.e., protein S deficiency) state. However, a differential of PAN was still considered as both conditions can coexist. A decision to start both anticoagulation and immunosuppression was made in view of both differentials and patient's refusal for nerve biopsy to further confirm the diagnosis. The patient was initially started on the overlap of low-molecular-weight heparin and warfarin with prednisolone 1 mg/kg and mycophenolate mofetil following which her sensory and motor symptoms improved and skin lesions resolved completely over the next 2 months. Steroids were gradually tapered and stopped, and mycophenolate discontinued after 6 months as the patient had no clinical worsening despite stopping her steroids and there being no available definitive evidence of PAN. At 12 months of follow-up, the patient is presently only on anticoagulation and is doing well with no recurrence of skin lesions. Repeat protein S functional activity (29.3% [normal 50%–140%]) and free antigen levels (38.5% [normal 60.1%–113.6%]) done 1 year later after stopping anticoagulation for 2 weeks were still reduced. LV is a noninflammatory thrombotic condition, associated with hypercoagulable or impaired fibrinolytic states, characterized by recurrent painful purpuric ulcerative lesions around the ankle and dorsum of the feet that heal with stellate porcelain white scars. Histopathology reveals segmental vessel wall hyalinization of dermal blood vessels with fibrinoid deposition in the lumen and usually minimal perivascular lymphocytic infiltration. Direct immunofluorescence (DIF) may show the deposition of immunoglobulin, fibrin, and complement components. Intraluminal thrombosis of dermal blood vessels leads to ischemia of the cutaneous microcirculation and subsequently cutaneous infarction. LV has an incidence of 1:1,00,000 per year, usually affects the age group of 15–50 years and is more common in females (2.4–3:1). Lesions usually begin as painful macules and/or papules in the lower limb that often ulcerate and heal slowly over weeks or months into atrophic porcelain white scars surrounded by punctate telangiectasia and brownish pigmentation., They may be accompanied by livedo racemosa – bluish-gray broken ring-like macules, caused by reduced cutaneous blood flow. Neurological involvement in LV is rare and presents usually as mononeuritis multiplex, months to years after the onset of cutaneous lesions. Neuropathy occurs secondary to ischemia from vascular thrombosis of vasa nervorum. Nerve biopsy typically shows the features of axonal loss with vasculopathy. English articles available on PubMed with no limit on publication date were reviewed on September 23, 2018 using the combination of following search words: “livedoid vasculopathy,” “livedoid vasculitis,” “segmental hyalinizing vasculitis,” and “neuropathy” or “mononeuritis multiplex.” The total number of articles derived from the PubMed search was ten, and a total number of patients described were 29. These were then read, analyzed, and cross-referenced. The reference lists of selected review articles citing the above articles were studied to obtain additional original articles and data obtained compiled [Table 1]. Differential diagnosis includes small and medium vessel vasculitis (especially PAN), chronic venous insufficiency, pyoderma gangrenosum, and Degos disease. Conditions associated with LV include inherited and acquired thrombophilias, autoimmune rheumatic diseases, and malignancy [Figure 3]. In a prospective study of 34 patients with LV, 18 (52%) had underlying procoagulant condition with protein C and/or S deficiency in only 3 (8.82%) patients. Our case of LV with mononeuritis multiplexes due to underlying protein S deficiency closely mimics medium vessel vasculitis and represents the typical diagnostic and therapeutic challenges in the management of such lesions. A nerve biopsy and abdominal angiography would be preferable to conclusively rule out PAN; however, typical cutaneous biopsy findings on deep dermal specimen, persistent low protein S, and response to anticoagulation alone after stopping immunosuppression would favor LV. Alavi A, Hafner J, Dutz JP, Mayer D, Sibbald RG, Criado PR, et al. Livedoid vasculopathy: An in-depth analysis using a modified Delphi approach. J Am Acad Dermatol 2013;69:1033-420. Criado PR, Rivitti EA, Sotto MN, de Carvalho JF. Livedoid vasculopathy as a coagulation disorder. Autoimmun Rev 2011;10:353-60. Kerk N, Goerge T. Livedoid vasculopathy – A thrombotic disease. Vasa 2013;42:317-22. Sajjan VV, Lunge S, Swamy MB, Pandit AM. Livedo reticularis: A review of the literature. Indian Dermatol Online J 2015;6:315-21. Toth C, Trotter M, Clark A, Zochodne D. Mononeuropathy multiplex in association with livedoid vasculitis. Muscle Nerve 2003;28:634-9. Winkelmann RK, Schroeter AL, Kierland RR, Ryan TM. 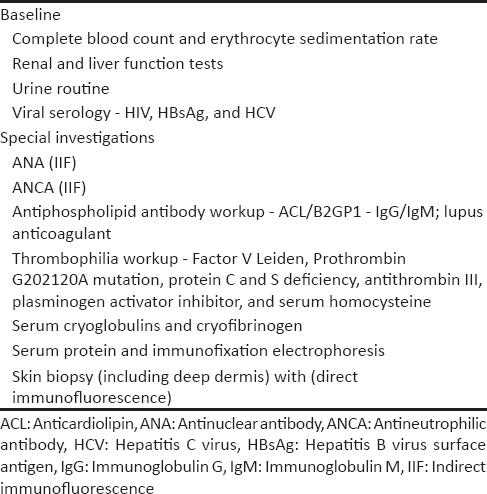 Clinical studies of livedoid vasculitis: (segmental hyalinizing vasculitis). Mayo Clin Proc 1974;49:746-50. Osada S, Kimura Y, Kawana S. Case of livedoid vasculopathy with peripheral neuropathy successfully treated with low-dose warfarin. J Dermatol 2010;37:98-101. Kim JE, Park SY, Sinn DI, Kim SM, Hong YH, Park KS, et al. Ischemic neuropathy associated with livedoid vasculitis. J Clin Neurol 2011;7:233-6. Gan EY, Tang MB, Tan SH, Chua SH, Tan AW. A ten-year retrospective study on livedo vasculopathy in Asian patients. Ann Acad Med Singapore 2012;41:400-6. Pai B S, Pai K. Livedoid vasculopathy and mononeuritis multiplex, with a fulminant hepatic failure which was caused by herpes simplex hepatitis: A Case report. J Clin Diagn Res 2013;7:921-3. Tubone MQ, Escobar GF, Peruzzo J, Schestatsky P, Maldonado G. Livedoid vasculopathy associated with peripheral neuropathy: A report of two cases. An Bras Dermatol 2013;88:227-9. Malaguti MC, Cavallaro T, Speziali L, Zorzi MG, Marangoni S, Morini A, et al. Mononeuritis multiplex associated with primary livedoid vasculopathy: Neuropathological evidence of ischemic nerve damage. J Neurol Sci 2015;351:214-5. Alix JJ, Hadjivassiliou M, Ali R, Slater D, Messenger AG, Rao DG, et al. Sensory ganglionopathy with livedoid vasculopathy controlled by immunotherapy. Muscle Nerve 2015;51:296-301. Allenbach Y, Tourte M, Stenzel W, Goebel HH, Maisonobe T, Frances C, et al. Expanding the spectrum of livedoid vasculopathy: Peculiar neuromuscular manifestations. 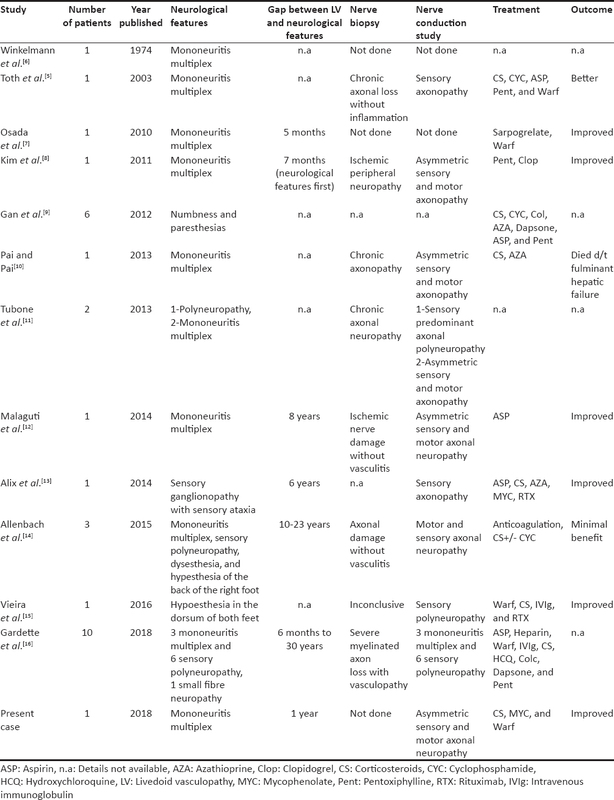 Neuropathol Appl Neurobiol 2015;41:849-52. Vieira R, Bernardes JM, Pinto JA, Costa L. Livedoid vasculopathy – A challenging disease. Acta Reumatol Port 2016;41:273-4. Gardette E, Moguelet P, Bouaziz JD, Lipsker D, Dereure O, Le Pelletier F, et al. Livedoid vasculopathy: A French observational study including therapeutic options. Acta Derm Venereol 2018;98:842-7. 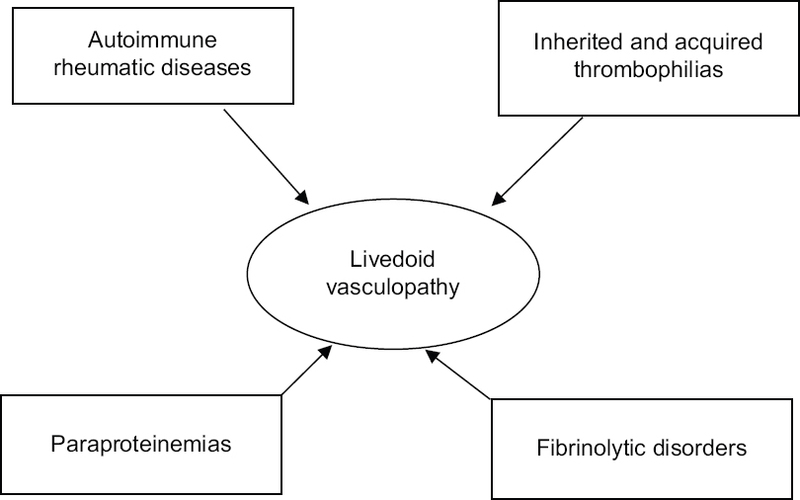 Vasudevan B, Neema S, Verma R. Livedoid vasculopathy: A review of pathogenesis and principles of management. Indian J Dermatol Venereol Leprol 2016;82:478-88. Di Giacomo TB, Hussein TP, Souza DG, Criado PR. Frequency of thrombophilia determinant factors in patients with livedoid vasculopathy and treatment with anticoagulant drugs – A prospective study. J Eur Acad Dermatol Venereol 2010;24:1340-6. Mimouni D, Ng PP, Rencic A, Nikolskaia OV, Bernstein BD, Nousari HC, et al. Cutaneous polyarteritis nodosa in patients presenting with atrophie blanche. Br J Dermatol 2003;148:789-94.